Autism is a spectrum disorder which can cause mild to severe problems. Autism is normally diagnosed in the first 3 years of life. Every person with autism exhibits different behaviors such as problems with communication and social skills but these may not be exhibited in the same way for each person. Some autistic people will focus on one thing, some may do things over and over again while others may object to changes in diet or daily living schedule. Signs of autism are not wanting to eat different foods or needing help with fine and gross motor skills, like writing and running. Many times people with autism have problems following directions, understanding and using words, having conversations and learning to read and write. A person with autism may repeat words they have just heard or heard days or weeks earlier, sound robotic or talk in a singsong voice or have tantrums instead of conveying their wishes to you. Some may talk well but not be able to make friends and others not talk at all. Many autistic people have problems relating to other people. It may be hard for them to focus with someone on the same object or event, play with others or share toys, understand how others feel or make and keep friends. They may also have trouble changing from one activity to the next, get upset at certain sounds, like only certain foods or have an interest in only a few things, such as talking about one subject or staring at one toy. 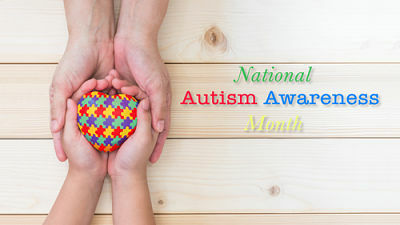 Autism may be caused by genetic problems or syndromes, severe infections that can cause brain damage, such as meningitis and encephalitis, or from problems during the mother's pregnancy. Also, in some, the cause of the autism may never be determined. Many things go into testing for autism. When first being diagnosed, the person may see their physician, a neurologist, a physical and occupational therapist, developmental specialist and many other doctors. A speech and language specialist may discover the autism, since they may be the first person seen for speech or language developmental issues. There is no cure for autism. Since autism is normally diagnosed at a young age, the earlier treatment is started, the better. Check into local early intervention programs and preschool programs. These programs can help your child at home and then at school. A Speech and Language Pathologist can help in many ways, from language to social skills. They also help those who can't talk at all. If you know someone who shows any of these signs or you suspect they may have autism, contact your physician or call Sabetha Family Practice at (785) 284-2141 for an appointment. Early intervention is important.